I’ve been trying to train. Really, I have. It seems though that my luck is just not with me lately. Either that, or all my luck is bad. Sunday was an eight hour day at work, so that left me with a bit of time for a little run. It was a short one, but that was planned. For some reason, I had been feeling less than good Sunday and thought a short slow run would help me feel better. Silly me. While running, I felt better. Then I caught that little stump in the trail with my toe. We call those little stumps, stobbies around here. So I caught a stobby, it hurt, but not bad enough to stop running. 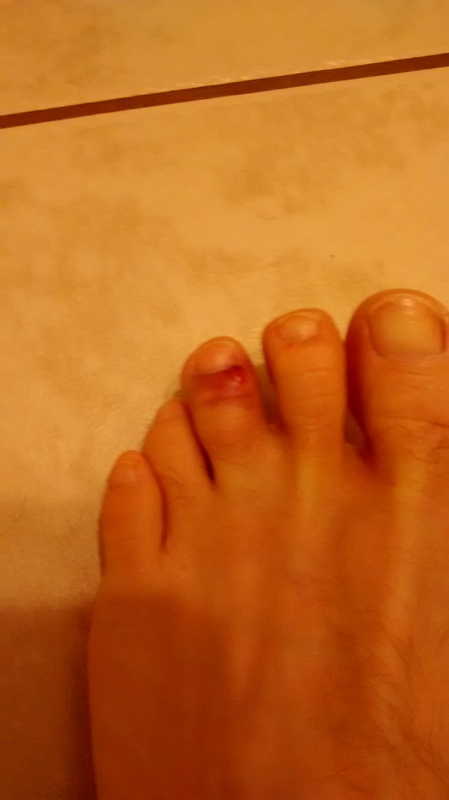 Now, I’ve got a swollen middle toe, that hurts when it bends. Not what I needed. Maybe I can learn from this. See, I prefer to do most of my training runs in Vibram Fivefingers toe shoes. They are great, and I believe they are the reason my knees don’t bother me anymore. That being said, they do pose a danger to my toes while running out in the woods. They are minimalist shoes after all, so that is to be expected and not really their fault. What I may have to do from now on, though it pains me but maybe not as much as those stobbies, is wear a fuller shoe out on trail runs. Something with a bit more toe protection. I don’t like it, but I don’t like blue, swollen toes either. I will still wear the Vibrams out on the dirt road and places where the stobbies are not expected or are at least more easily seen. I love the Vibrams, but I’ve got to face the fact that they may not be suited to every situation. Well I better run. Or maybe hobble on my way now. Hope you guys are having a great day and that all your toes are their correct color. Happy running, and God bless! I recently bought a pair of zero drop trail shoes from Salomon, the S-lab sense 4 ultra sg…while not minimalist they’re like running with a slipper attached to a tire the sole protection is so good yet so light. Check them out, might be what you’re looking for. I’ve been meaning to get to my local running store to see what they’ve got. Had my eye on the innov-8, but I’ll definitely check out the Salomon while there. Thanks for the recommendation. No problem..I went with Salomon bc I’ve used their shoes for years and I trust them. Plus the no lace cinch system is amazing, no tying laces, just pull, cinch and go.